In July 1942, the French police in Paris, acting for the German military government, arrested Victor Ripp's three-year-old cousin, Alexandre. Two months later, the boy was killed in Auschwitz. 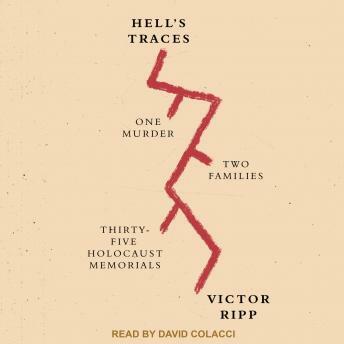 In Hell's Traces, Ripp examines this act through the prism of family history. In addition to Alexandre, ten members of Ripp's family on his father's side died in the Holocaust. His mother's side of the family, numbering thirty people, was in Berlin when Hitler came to power. Without exception they escaped the Final Solution. Hell's Traces tells the story of the two families' divergent paths. To spark the past to life, he embarks on a journey to visit Holocaust memorials throughout Europe. A memorial in Warsaw that includes a boxcar like the ones that carried Jews to Auschwitz compels Ripp to contemplate the horror of Alexandre's transport to his death. One in Berlin that invokes the anti-Jewish laws of the 1930s allows him to better understand how his mother's family escaped the Nazis. In Paris he stumbles across a playground dedicated to the memory of the French children who were deported, Alexandre among them. Ultimately, Ripp sees thirty-five memorials in six countries. He encounters the artists who designed the memorials, historians who recall the events that are memorialized, and survivors with their own stories to tell.